Liz Rooks takes the stage to receive a 2015 Goodmon Award. Each year the Leadership Triangle Goodmon Awards honor those throughout the Triangle community that are doing their part to give back and change the face of the place so many now call home. 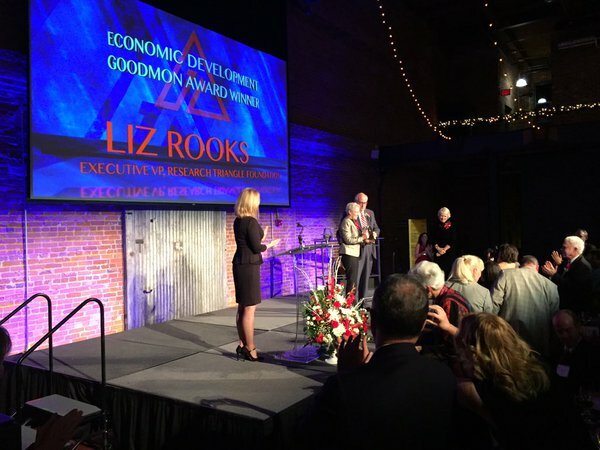 It’s our honor here at the Research Triangle Foundation of NC to announce that Liz Rooks, Executive Vice President, has received a Goodmon Award for Economic Development. She was presented with the award at the annual Goodmon Awards Gala at Bay 7 in the America Tobacco campus in downtown Durham. Ms. Rooks will be retiring from her position at the Research Triangle Foundation on December 31, 2015. For more than 25 years she has served as a leader both in Research Triangle Park and the wider community. As a whole, the Goodmon awards honor those that understand the importance of working together, regional thinking and regional cooperation. Ms. Rooks has embodied this throughout her career by working tirelessly with both Durham and Wake Counties, the Research Triangle Regional Partnership, and the NC Department of Commerce to locate companies with RTP. Her impact on our area’s economic prowess can be seen through the continued success of Research Triangle Park, and the more than 200 companies located here. To be given this award truly speaks to her stature as a leader in economic development. Many supporters from the RTF family were on hand to congratulate Ms. Rooks: Bob Geolas, President and CEO of Research Triangle Foundation; Mason Ailstock, Chief Operation Officer of Research Triangle Foundation; Bob Ingram, former Chairman of Research Triangle Foundation Board of Directors; Ginny Bowman, Research Triangle Foundation Board of Directors; Robert Teer, Jr., RTP Owners and Tenants Committee; Stan Parker, RTI International. The Goodmon Awards were established in 2002 in honor of James F. Goodmon, president and CEO, Capitol Broadcasting Company. The awards recognize leaders across the Triangle who are regionally minded – and who exhibit that frame of mind in both their personal and professional lives.